Pictured here are some of FIBR's most dedicated and long-standing members – taken in the late 90's, this pictures has some of our first members, founding board members and regulatory partners! Center left in the Green dress is Founding President Gina Harpur of Juanita's Foods, on her right founding Members Henry C. Leong of Great Harvest Foods and Kenny Yee (formerly) of Wing Hing Noodles. 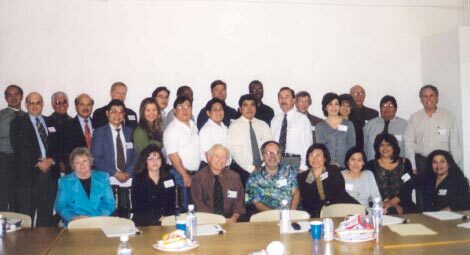 Founding member and past Board President Mark Roth of El Burrito Food Products is pictured center left (maroon shirt and black tie). FIBR stepped up to the plate when it became an official partner of the Green Urban Manufacturing (GUMI). 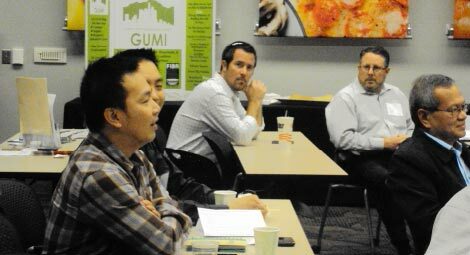 GUMI was a pilot project designed to green urban manufacturers in Southern California. FIBR co-sponsored a series of educational seminars on topics from Waste Reduction and Pollution Control to R&D Tax Credits. Members were also introduced to greening opportunities for their businesses through government and utility programs. FIBR believes that Greening your Business is Good for the Environment, Regulatory Compliance, Consumer Demand and most importantly - Your Bottom-line! The Food Industry Business Roundtable (FIBR) is a nonprofit business association dedicated to promoting the growth of the food processing industry in Southern California. The Food Industry Business Roundtable (FIBR) is a non-profit business association of food processors in Southern California. FIBR was incorporated in 1996 as part of the Rebuild L.A. (RLA) manufacturing networks initiative and continued under the Community Development Technologies Center (CDTech)'s Los Angeles Manufacturing Networks Initiative (LAMNI). Over FIBR's 20 year history, we have grown from an initial five founding members to over 150 members today. Comprised of primarily small to medium sized businesses, our members are located throughout the Southern California region. FIBR members' products are diverse and include everything from ice cream to sausages, salad dressings to menudo, and sushi to artisan breads. The Food Industry Business Roundtable (FIBR) is a non-profit trade association (501)c6 that is governed by a volunteer Board of Directors. FIBR believes in Partnerships. Partnerships lead to collaborations that serve not only FIBR's members, but the larger food processing community. As a small non-profit organization, FIBR has found that these Partnerships not only create great relations among other groups and organizations, but help FIBR achieve many goals and provide programs that otherwise would not be possible.